When you are looking at modular homes, be sure your builder has the high quality, high demand options that will make your home perfect for you and your family. When you are looking for a new modular home, it can be overwhelming to find just what you are looking for. There are many brands, floor plans, and land options available. Palm Harbor Homes is happy to help pair you with the perfect modular home. We know that each customer has unique needs and requirements. To get to the bottom of what you need out of your modular home, here are a few questions you want to ask before choosing your modular home. Many modular home companies only give you cookie-cutter styles to choose from. Custom options, particularly those of high quality, are very hard to find. Palm Harbor Homes have several customizable options that you can choose. Durabuilt custom cabinetry allows you to build the exact look and feel you want in your kitchen. We also offer a variety of durable ceramic tile options that can enhance the style of any home. Is This Modular Home Energy Efficient? As the price of utilities climb, it has become more and more important to have a home that is energy efficient. Manufactured and modular homes can be exceptionally energy efficient. Palm Harbor Homes takes things a step forward and provides both EnerGmiser® and ENERGYSTAR® packages with our modular homes. Our energy efficient packages can provide up to 30% savings on your energy bill. Make sure that your modular home won’t cost you an arm and a leg to power each month! Is This Modular Home Safe? One of the biggest concerns of modular and manufactured home owners is the safety and durability of their home. This is especially true if you live in an area prone to severe storms and hurricanes. Palm Harbor’s modular homes can weather the storm better than any other modular home on the market. With our SmartPlus® construction technology, our homes are built solid, and you can rest easy knowing your home is safe and secure. 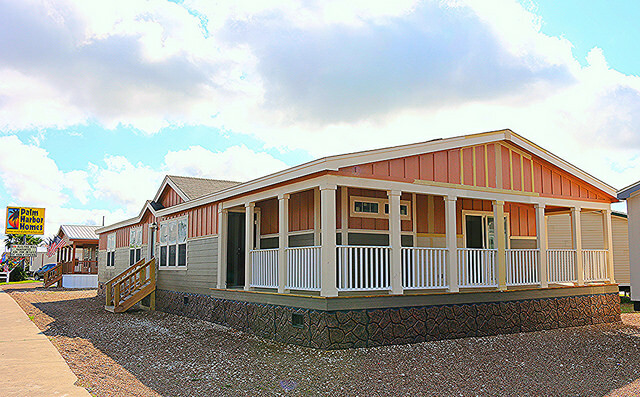 If you have any other questions about our modular homes, contact Palm Harbor Homes today. Call 1-888-466-3718 for more information about our modular home floor plans. Thought you might be able to help. I have a FHA loan on a manufactured home. My lot was refinanced into the loan as well. Is it normal to start paying the full loan amount prior to the homes delivery and installation?? I closed on 10/28. My first payment is due today. The dont have a delivery date. Tina Andrews – Well, we aren’t your lender, so we cannot give you a definite answer, but in our experience here’s what we have found. Some loans do require payments prior to delivery, but they are often interest-only payments during the construction phase. Our suggestion is that you get in touch with the lender and confirm that payment is actually due.